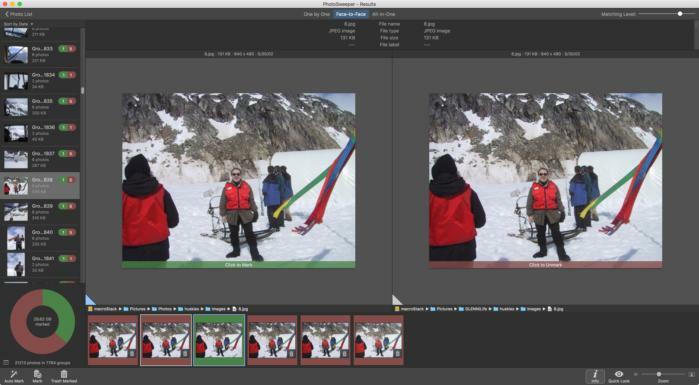 If you have many identical or similar copies of photos, wasting space or making it hard to find the best version, Photosweeper can sort that mess. To judge by email, Macworld readers have a lot of digital cruft. Many of you are like me, migrating from computer to computer, sometimes after system or disk drive disasters. This can leave you with a lot of duplicates of files of all kind, but images tend to be the most problematic. Between migration and multiple imports and copying for particular purposes, you could have several copies of the same image or scene, and sometimes they aren’t identical: one may be lower resolution, one may have been edited, and some might taken in quick succession but only one is good! Burst mode can lead to a lot of extra pictures, depending on your settings. Photosweeper 3 ($10 on the App Store is a well-updated version of software designed to solve this problem with a high degree of customization and specificity. Some other software, especially disk uncluttering packages, include image-duplication scanning. But with Photosweeper’s modest cost and laser focus, it’s worth the price. Depending on how many systems you have and photos you take, you might wind up using it every few months. The developers promise eternal free upgrades to new releases, which is a bonus. 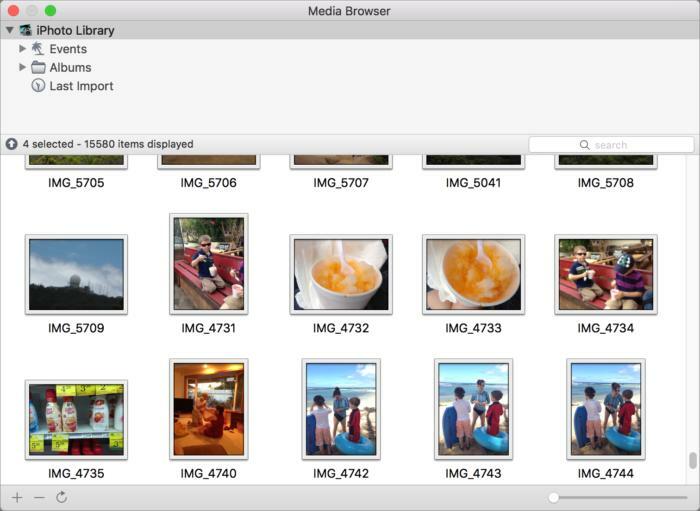 A Media Browser lets you examine images stored in iPhoto, Photos, Aperture, or Lightroom libraries, and then add them to compare. The app starts by having you pick locations to scan, and it automatically recognizes libraries for iPhoto, Photos, Aperture, and Adobe Lightroom, allowing it to parse the storage format and look inside packages, instead of indexing endless thumbnails and other files that are used directly by those apps. You can also use a Media Browser option that lets you drag any of those library types into a window and then look through them. I tested Photosweeper with an enormous set of images stored on an external drive connected to a Mac mini via USB 3, and it performed extremely well, scanning over 200GB of images (nearly 50,000) in several minutes, generating previews as it went. At that point, you can view images as in a photo browser, but you click the Compare button to engage the real functionality. Photosweeper has a lot of settings, all of which seem straightforward. 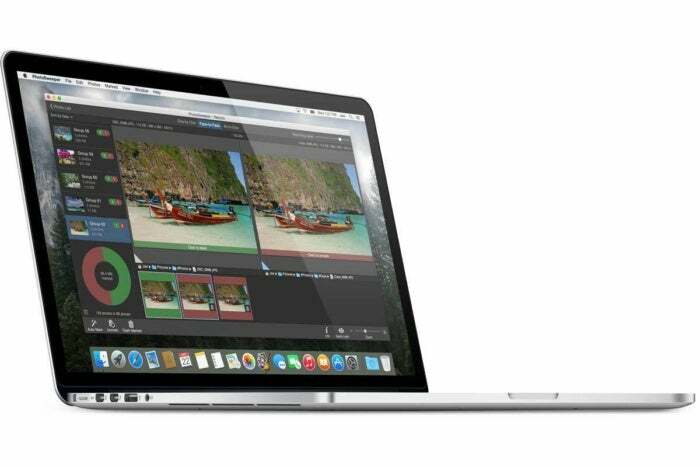 It offers three modes: Duplicate Files, which looks just at file names (though you can customize how much of the file to examine); Similar Photos, which provide sliders and basic and advanced options; and Series of Shots, which can identify bursts of photos. I suspect most of us will use Similar Photos, though with smartphones and large memory cards in digital cameras, Series of Shots could be quite useful too. The Similar Photos options offer a lot of restrictions to make sure you don’t make too many or too view. For instance, you can choose to compare any photos, any photos with the same pixel dimensions, or only photos with the same aspect ratio. That last option would match resized images, but not cropped ones, while the first option for any photos might do better. You can also use a slider for Time Gap, so that the metadata consulted for capture time has to be within a specific range. That helps with bursts. A group of matched photos may contain only identical images with different resolutions or crops or, as shown here, different images that are similar and taken in a burst. Advanced options let you compare histograms, which are the distribution of tones within an image, exact bitmaps, and control the level of detail compared. Instead of a one-size-fits-all or one-size-plus-some-variants, Photosweeper 3 lets you customize the matching to the particular type of image similarity you need. On my enormous photo set, it took about 20 minutes to perform a Similar Photos comparison, showing you nifty abstracted thumbnails—sort of reduced-fidelity fingerprints of images the program creates for comparison purposes—as you watch the comparisons proceed. A results window offers a list of matches at left, and lets you review either one at a time, in a face-to-face view (new in version 3), or as a set of images. However, from a 2010 family photoshoot, with the slightly loose settings I used, groups of distinct images taken by the photographer as a burst were grouped together as well. This is actually quite useful: I can review these sets and figure out if I need to keep nine 11MB images forever, or pick the best one or two and dump the rest. I’m sentimental, but I’m also realistic about how many nearly identical images are worth keeping. A Face-to-Face mode maximizes screen area for comparisons. While the Face-to-Face view lets you compare two photos at a time displayed as big as they can be, I like the All-in-One view quite a lot to see the entire set of matched similar images. Fortunately, Photosweeper 3 retains your position in matched images, which it marks as numbered groups, when you switch among views—as long as you have at least one image selected. If you switch without a selection, it jumps back to Group 1. An deep Info sidebar in One by One and All-in-One views show all an image’s metadata, which is quite handy if you’re trying to make better determinations about which to keep. Auto Mark uses hierarchical rules you can re-order and customize to try to pick the best match from a set of similar ones. Beyond the comparisons, useful in themselves, Photosweeper’s Auto Mark feature does a fantastic job of letting you prioritize which image you likely want to keep among a set. You can perform an Auto Mark operation immediately after performing a comparison or at any point while view the results. The app offers a set of conditions that you can rearrange that it uses to score photos, such as whether the metadata contains a star rating, the creation date (being earlier or later than other photos in the set), image density (dots per inch), and so forth. You can also mark images individually to delete or retain. You can use extremely detailed advanced criteria for finding similar images, useful for particular kinds of photo sets you want to de-duplicate. The semi-terrifying last step is likely to click Trash Marked, which drops the images into the system Trash, after which point then you need to empty the trash in the Finder to truly get rid of them. Have I mentioned that backups are great? The program warns you when you click to trash images so you don’t accidentally trigger that action, which, while reversible, would be pain, like stuffing toothpaste back into the tube in terms of moving images back to the folders you had them in. Photosweeper doesn’t let you save the state of a comparison as such; it will retain the last session when you close the main window or quit the app, and can restore that, and it keeps the various locations you specified in setup in its sidebar. But you can’t save sessions to bring up again. That would be the one big improvement it could bring as an option, but it might be useful only in limited circumstances. The app rewards time spent with it, as there are even more features and options I’m not covering, including consolidating images by copying those you select into a single folder, no matter their origin. 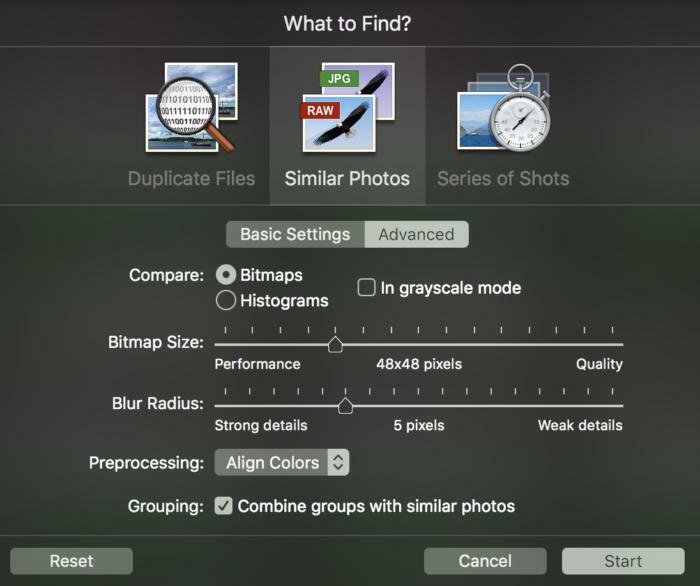 Photosweeper 3 is smart enough to avoid extra duplication between media libraries and photos in folders. 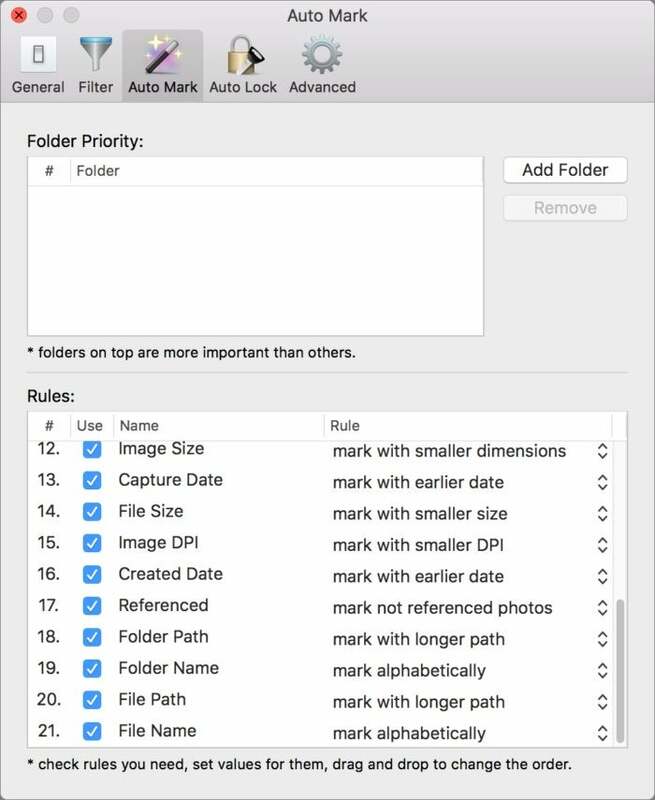 If you’ve been wrestling with duplicate or similar images scattered across your Mac’s startup drive or multiple drives, Photosweeper 3’s flexibility in how you find images you don’t need to keep lets you fine tune results depending on each set of photos you want to examine. That flexibility, power, ease of use, and excellent automatic marking of the likely best image to keep make it easily worth its low cost and perpetual upgrades.